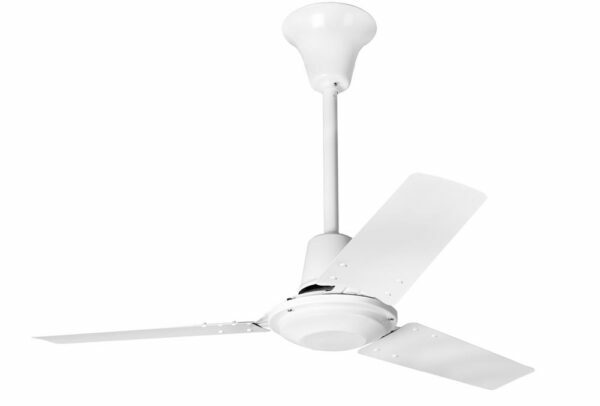 Fantasia 36″ commercial ceiling fan in white with white metal blades is compact and features a drop mount design. Quiet, vibration free operation and energy efficient, with variable speed capacity. Supplied pre-assembled for easy installation, reversible for summer and winter use and comes fitted with a 12″ drop rod. This commercial fan has white finish motor housing and blades. The motor is almost silent when operated on the lower settings and consumes 45w of electricity at the highest speed setting to give an impressive airflow of 5000 cu/ft per minute. Please Note: This fan has variable speeds and requires a commercial wall control to operate; please see below for options. This Fantasia 36″ commercial ceiling fan in white with white metal blades is supplied with a manufacturers 1-year guarantee. 1. Is it possible to install this fan without the 12″ drop rod? I have a low ceiling and highish bed so need the fan to sit near the ceiling. 2. If so could you give the total drop measurement without the rod. 3. Is it suitable for a smallish residential bedroom? 4. how quiet is it? This ceiling fan is supplied with and must be used with the drop rod included. It is suitable for a residential bedroom, but as it is classed as a commercial fan, it must be controlled with one of the commercial fan controllers shown on the product page. It runs very quietly and is vibration free.